Whenever you come across a named enemy in the open world, you may notice they drop a single playing card upon death. These are the 52 Division 2 Snitch cards. You can complete the full deck of Division 2 Snitch cards by killing 52 unique named enemies in The Division 2, and once you complete a suit, you'll earn the Suits You, Sir! trophy/achievement. If you're wondering how to farm the cards and find names enemies much quicker, read on for our complete Division 2 Snitch cards guide. What are Division 2 Snitch Cards? Division 2 Snitch Cards are essentially trophies of your notable kills, but rather than mounting their heads to a wall in the White House, you just keep their respective playing card in your back pocket. There are 52 Snitch Cards to collect in total, 13 per suit. Each suit is for each faction so the Hyena Snitch Cards are all Spades, True Sons are Hearts, Outcasts are Clubs, and Black Tusk are Diamonds. To earn all 52 Division 2 Snitch Cards, you need to kill 13 specific named bosses from each faction. Completing one suit will earn you the Suits You, Sir! trophy, and you'll get a bunch of XP and E-Credits for completing the full deck. Collecting all of the Division 2 Snitch Cards is a case of killing 52 named bosses, but how do you find those enemies? 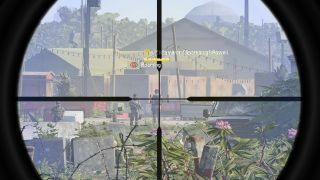 You can find and kill a plethora of named enemies through the Division 2 bounties, which gives you the location of a specific target you have to hunt down and kill in under 15 minutes. They're not easy, and you'll have to kill a lot of their minions first, but you can obtain a number of Snitch Cards this way. There's also a lot of named enemies you can find out and about in the world. We know of two farming spots that you can revisit every 30 minutes to find a new named boss to kill, and they'll usually drop another Snitch Card for the deck of 52. The first is directly south of the White House, just past the circular pond with a fountain in the middle. In the middle of the road, you'll usually find a named enemy hanging around with a few of their underlings. Our second farming spot is in the courtyard directly south of the District Union Arena stronghold. This is also the place you spawn the Crimson Hunter for the Division 2 masks, so we'd recommend killing two birds with one stone and doing them both together. If you're sneaky, you can spawn in the Crimson Hunter and set him on the other enemies. That's all there is to it. With 52 Snitch Cards to collect in total, you'll be trying for a while to complete the full deck, but you should be able to earn the Suits You, Sir! trophy/achievement without too many problems. Once you're done with the Snitch Cards, read up on all of the Division 2 Exotics and how to get them.